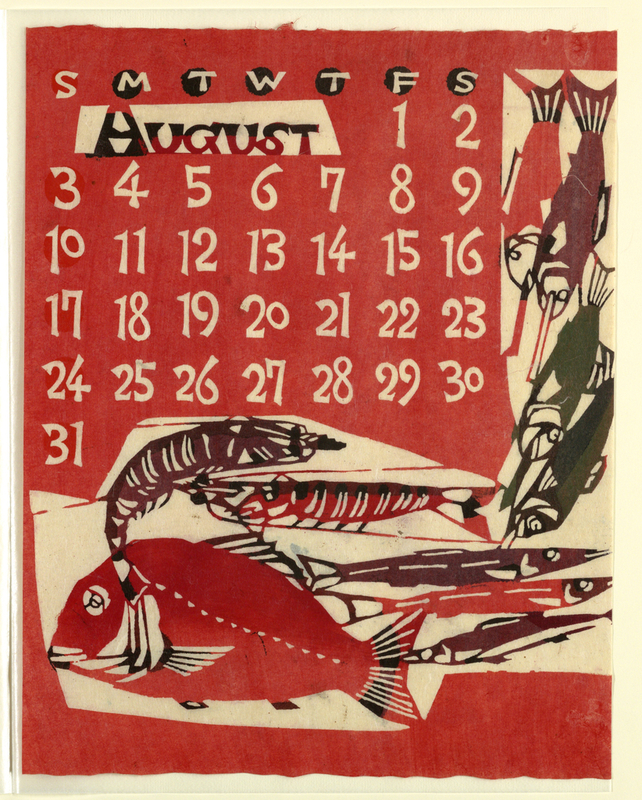 The brightly saturated colors of this August calendar page seem like a perfect salute to summer. To create the designs for this 1969 calendar, Takeshi Nishijima applied a paper-dyeing technique based on the traditional resist-dyeing process of katazome. Katazome relies on the use of katagami (stencils) to create hand-patterned textiles, most of which were used for kimono. After making the katagami, Nishijima prepared the paper for printing by spreading rice paste through the stencil and then applied natural dye pigments to the page. After dyeing, the rice paste resist dissolves in water, revealing the stencil design preserved on the pigmented page. Finding new uses for traditional craft practices captured the interest of many twentieth-century Japanese artists and designers. Nishijima and others reviving traditional handcrafts were part of the Japanese Folk Art Movement Mingei, which emerged in the 1920s as an effort to prevent the disappearance of traditional craft practice in the wake of growing industrialization. Much as nineteenth-century Arts and Crafts designers such as William Morris turned away from industrial tools, Mingei valued works that were produced by hand rather than those made by machine. Interestingly, the English text of this calendar signals that Nishijima was producing these folk-art designs for a Western market. Why then was this technique appealing to a Western audience? Though Western consumers were likely less familiar with the katazome process, publications such as the 1968 Whole Earth Catalog reflected an American interest in learning about traditional crafts as well as an emerging DIY movement that prioritized making by hand. While Nishijima’s 1969 calendar successfully mapped out the future year, the attention of this calendar design to techniques of the past would have been a significant source of its appeal. I just listed The Whole Earth Catalog as a book that had a strong influence on my life. Your brief review of it clearly defined why. Thank you.